I am in the process of moving and recently spent the weekend stripping wallpaper. I couldn’t help but be fascinated by the layers of colour and decoration that I found. Who was the person who decided that deep pink was the colour of choice for the woodchip wallpaper they’d put in the front room? Aside from the obvious question of ‘what were they thinking?’, I found myself wondering more. When had they lived here? What were they like? As another layer gradually came off, there was a more decorative layer – flowers and leaf detail. Who put that there and when? What was their story? I finally got through to the bottom layer and discovered that the walls themselves had been painted at some point in a mustardy-yellow colour, complete with red & green spots, clearly added one by one, across the walls. What about those people? Why that colour combination? Were they the first ones to live there? Did they ever wonder about who would live in that tiny flat in the future? As a PhD student, my mind turned, as it often does, to my research. To the concept of ancestral time. As I peeled back through the layers of interior decoration and found myself wondering about the lives of the previous residents, I reflected on the many ways that we are impacted by and connected to previous generations in our everyday lives. recalling a past when building upwards was the only option, staying within the safety of the city boundaries. The grandeur of the Georgian New Town, designed by James Craig in 1768, reminds me of the ways people with a vision for a better future can impact that future: the streets are largely unchanged and I sometimes walk along wondering whether James Craig and his colleagues knew that their work would still be having impact in the lives of the people of Edinburgh nearly 250 years later. The past impacts the present. The past impacts the future. The present impacts the future. The idea of ancestral time grounds me in the knowledge that I am indeed connected to the generations who have gone before. That our society is connected to the generations who have gone before. And as such, we are also deeply connected to the generations who are still to come. Not just in the next ten, twenty or fifty years, but to the people whose lives will be playing out in the 2100s, 2200s, and beyond. It feels strange just writing those dates. Will someone be moving into ‘my’ flat in 2100, wondering why I chose a simple beige paint for my walls? 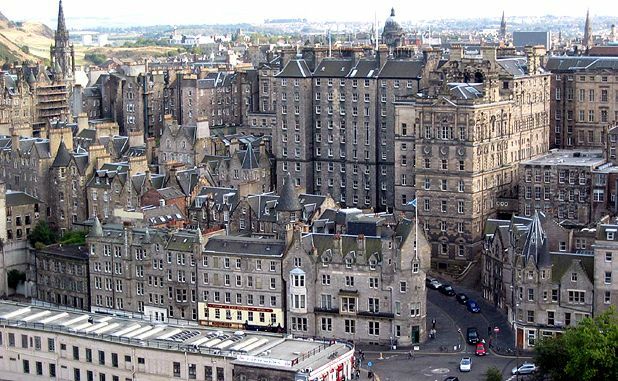 Will there be people walking the streets of Edinburgh in 2214 looking at the old historic buildings – those which are being built today? What vision are we casting for a future 250 years from now? How are we living in a way that considers our impact on future generations? When we connect ourselves to the past through the concept of ancestral time, we realise that ancestral time also connects us to the future. Ancestral Time provides me with a grounding for looking to the future with a bit more humility about my life today, and with a good deal more reflection on the responsibility and impact that we have for the future as well. I was just reviewing Calvinism and its early beginnings in Geneva spreading in Europe and to the New World. How the past has impact today and the future. How Calvinism today is still related from its early Reformed theology. So what would Ancestral Time do with our theological future now that we are globalized? Thanks for your blog Alice and maybe see you some- Time? An interesting thought – how theology and ideas are shaped through ancestral time as well. Definitely more to think about! Thanks for your comment.